It is nice to reflect that most of those who prey on society by committing criminal acts, are not usually the sharpest tools in the shed. Here we list, as a hall of honour, those really, really dumb and stupid crooks who by their actions, really leave you scratching your head. Every lawyer who has done a bit of criminal law has met 'em. Don't worry. You can trust us." Or these other two guys - same jail - different time - who wanted to retain me to sue the police for leg wounds received from police dogs that had tracked them down after a home invasion. Hello! Note also that there are so many urban legends out there, "information farmers" making dumb crook stories up. We chose a legitimate route of using verifiable stories only. It Wasn't Me. It Was Finley. On Friday, June 13, June of 1997, John Ruppell had too much to drink but he needed to get by a police road block on Highway US19. He looked at Finley. Finley looked at him with one eye and .... a light went on! "It looked like this iguana was driving. He had his claws on top of the wheel." 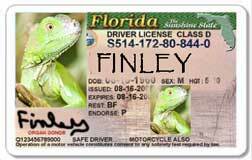 So they called the iguana in and when the vehicle pulled into a gas station, the officers converged on the car to find Ruppell sheepishly slouched back in the driver's seat, holding the front feet of his 3-feet pet iguana, called Finley, to the steering wheel. Ruppell was charged with drunk driving. Finley was adopted by a local animal rights group. Meet burglar Charles A. Meriweather. He committed break and entry into a dwelling house in Baltimore, Maryland on November 23, 1978. There, he assaulted the female occupant and then foraged through her residence, frustrated in finding only $11 in cash. So Meriweather had a merry idea: he asked his victim to write him out a check, payable, please, to Charles A. Meriweather, which she did. He then warned her that the check better not bounce or he'd come back. She reassured him that she was good for the check, and he left. Charles A. Meriweather was arrested when he presented the check for payment. "Give me all your money or I'll call the cops." "Give me all your money or I'll call the cops!" Well, at that, Basinger called Tate's bluff and even offered use of the gas station phone. Except that it was not a bluff. Tate called the cops and reported Basinger's behavior. The really shocking party of this story? When the cops arrived, they arrested John Tate. "The stench of the chicken feces resulted in the closure of the front entrance to the Court of Appeals for several business days, and necessitated a herculean clean-up effort in sub-freezing temperatures which consisted of using a pressure washer with water and detergent to wash the exterior marble walls and columns."